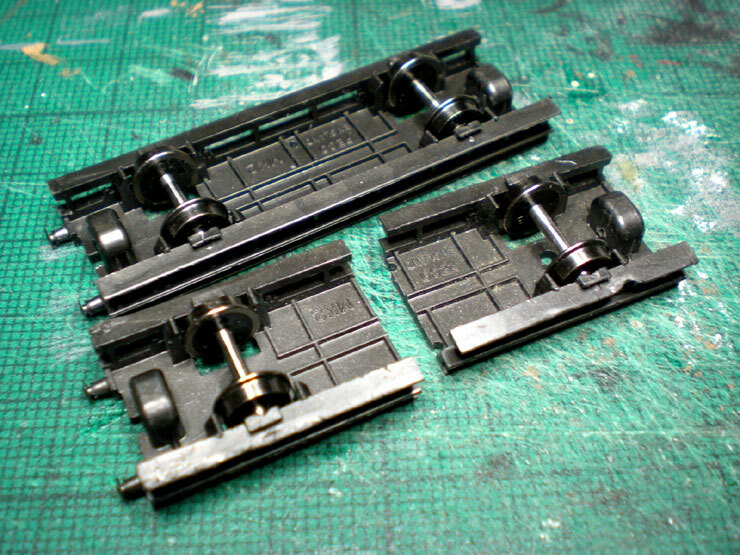 Being a sucker for punishment, when I found out that LSWR block sets of 6-wheel carriages were still around in 1930, and that Etched Pixels have produced them as part of the Ultima range, I decided that I needed some of them. By 1930, many of the first class carriages had been collected together into three 'race sets', providing better accommodation in special services from various towns in the south of England to a day at the races. There were quite a few famous race courses and meetings in the Southern Railway area (there still are, but most people these days go by car). 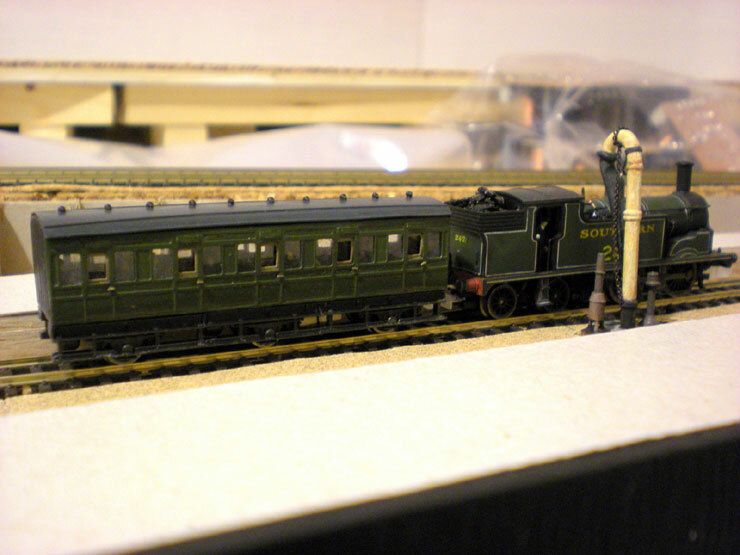 Each race set was formed of ten 6-wheel carriages, with a saloon at each end with normal couplings, then a first class coach with normal couplings at the saloon end and close-coupled at the inner end, followed by six more firsts, all close-coupled. The close-coupling was little more than a bar connecting carriages and a sort of 'bump' panel on each coach. Repeating that in N Gauge for tighter-radius curves would be a bit of a challenge, but I've done something similar with the double brake van (see page 6 of the general Grouping Workbench pages). A smidge of common sense sneaked in, and I shortened the ten-car set to eight, but that's still quite a bit of building. 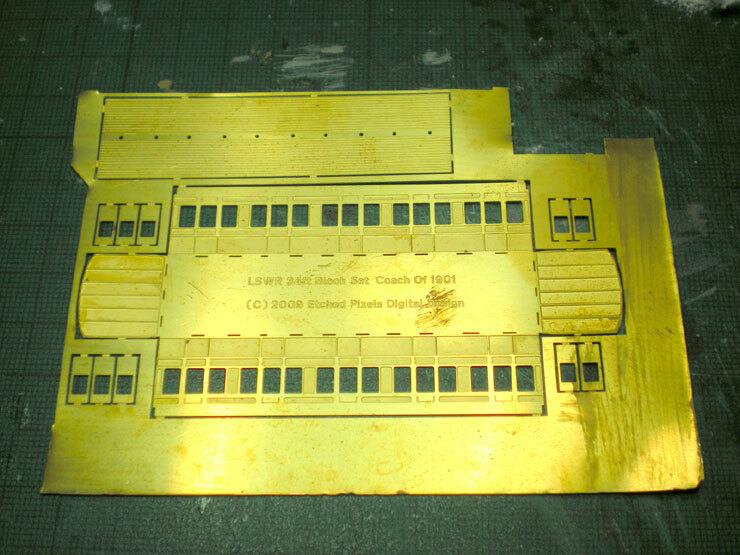 The Ultima 'kits' are supplied in etched brass, as in the photo below. 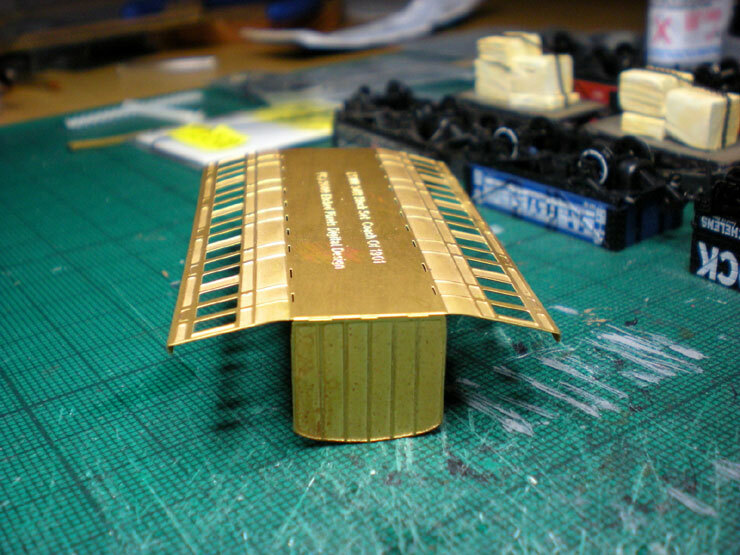 The roof is at the top, the main carriage body and floor in the middle, and the standalone 'droplights' at either side. 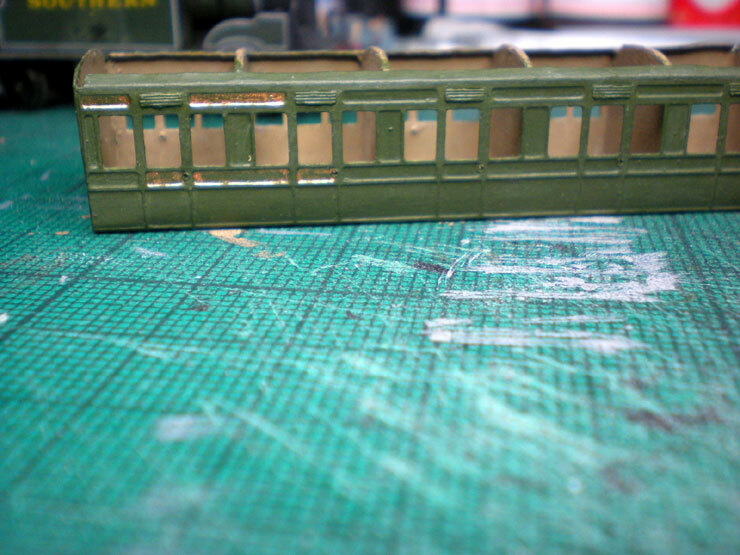 These need to be separately painted and glued in behind the doors... but there's also the 'tumblehome' to take into account here - the gentle inwards curve of the carriage body at the bottom of the side panels - and that complicates things quite a bit. 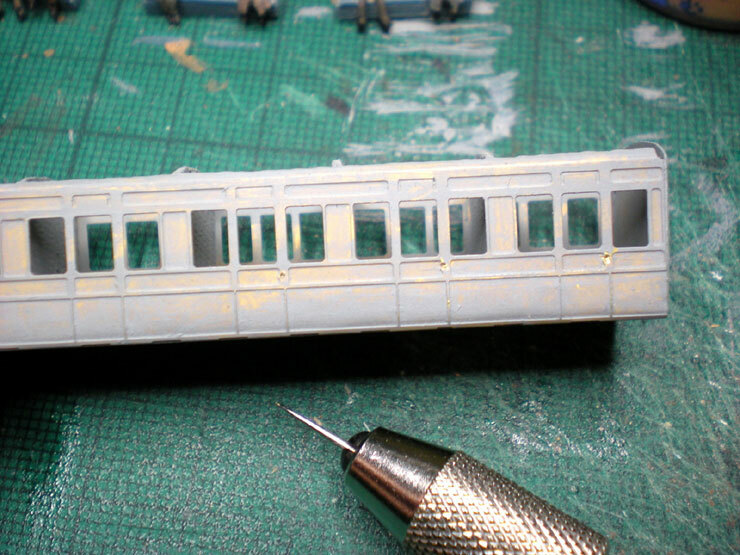 Anyway, on with the work on one of the central close-coupled firsts as a test coach. This one took a couple of months, on and off, as I had to work out how best to do several of the more tricky stages of the work. 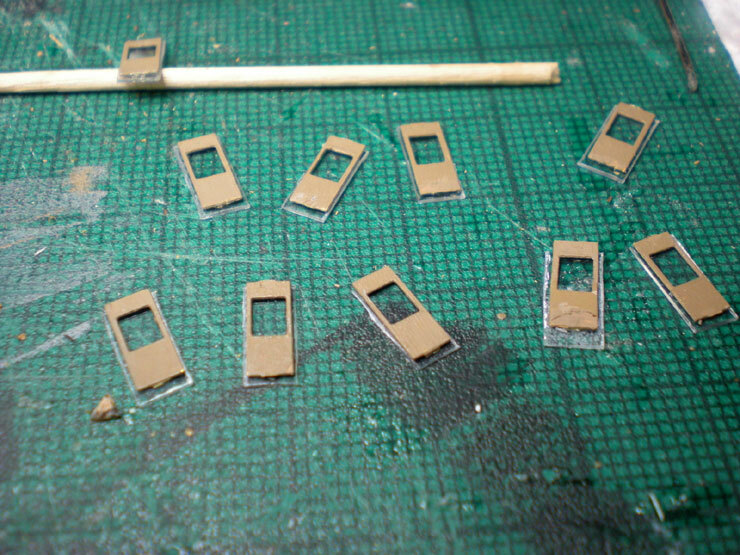 Remove the brass pieces from the etch and fold up the main body, adding the tumblehome curve to the lower side panels. That's harder than it might seem, and getting a consistent curve along the entire side panel means a bit of adjusting. 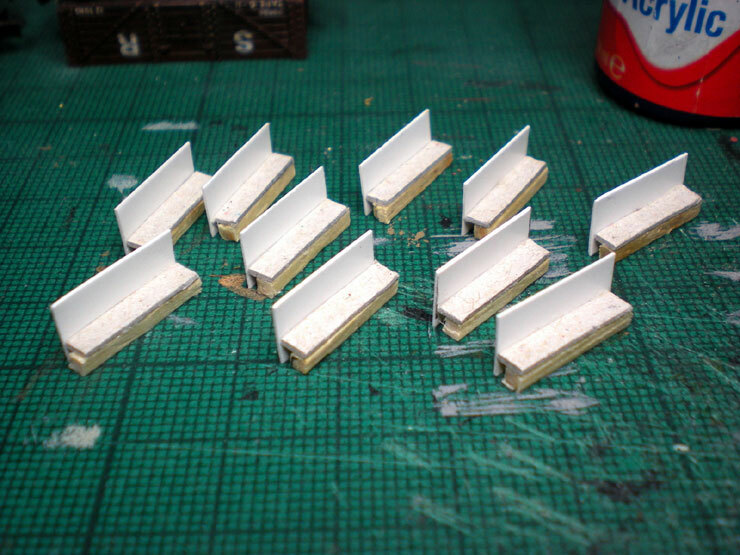 There were no instructions regarding the interior so I made up my own compartment dividers from card and also used these to glue the body in place. Yes, gluing. I'm not risking a soldering iron on this! 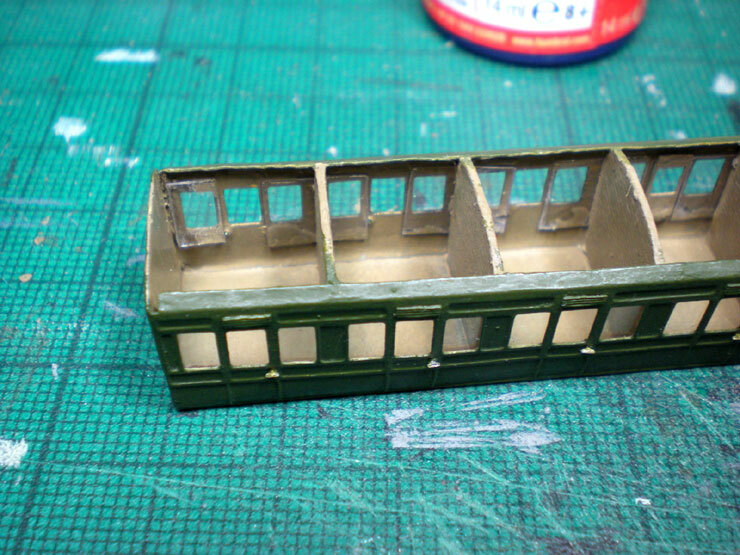 Next I needed bench seats for each compartment, so that meant cutting card and matchsticks. Something else was needed - door handles. I usually add grab handles too, but the Etched Pixel ones seemed too large for this kit, so only the door handles would be added. Drilling through the brass proved impossible with a hand drill. It just wouldn't go anywhere, and pushing against the assembled coach body was denting it quite badly - note to self, drill door handle holes before assembling body next time. In the end I put a darning needle in the hand drill and used that. It went through the brass very easily. A piece of card to serve as the back rest completed my bench seats. 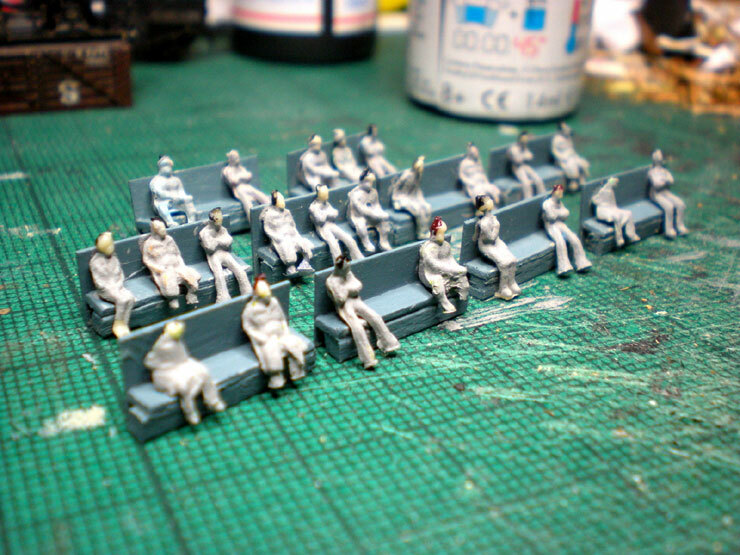 Now all the seats were painted in first class blue and some crazily-coloured passengers were added. Well, you lot can't go to the races in 1930 dressed like that, so we'll have to get you kitted out in more appropriate colours. They were all undercoated in grey before receiving a batch of muted colours - greys, browns, and blacks mostly, with the odd dull green or blue. The finished result will be seen later. 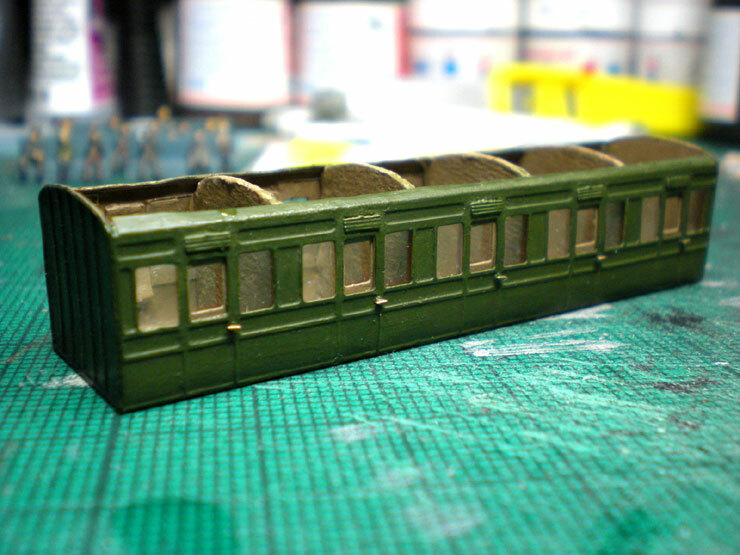 With the door handle holes drilled and top lights added (the grooved panels above the doors), it was time to start painting the body inside and out (wood-brown and Maunsell Green respectively). 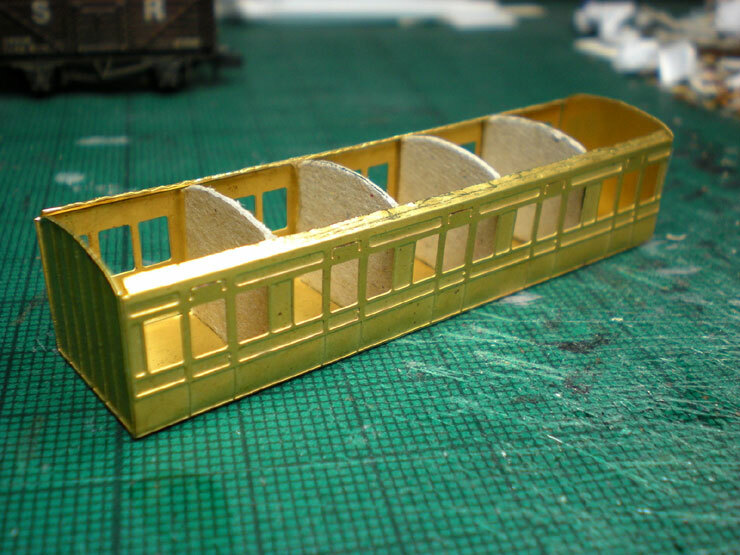 The brass roof was bent to shape and drilled so that the torpedo vents could be added. I did toy with the idea of adding the gold lining by filling in the panels and painting the green over the insides of each panel until only a fine line was left. In the end it proved too unreliable a process and I don't have a good enough paintbrush. The next time I buy paintbrushes, I'll splash out on a quality set that will actually last. Now the droplights have been added, although they fit very badly and needed a good deal of extra superglue added top and bottom before I felt reassured that they weren't going to fall off at the slightest handling. Now the passengers could be lowered in by crane, already attached to their seats (Southern and Southeastern take note - you'll be doing it like this before long). The benches were a little long at first, catching on the perspex, but a bit of careful trimming meant that they fitted in the end. You can see the final colours used on the clothing here. Now the roof could go on. Since that was last seen, I've added rain strips and cantrails. The cantrail at the roof's long edge helps to disguise a small gap between roof and coach body. A bit of filler hides the slight gap at the ends. Now for the wheels. There were a couple of choices for this, with the Stove R 6-wheel chassis being one. But that needs a lot of alteration to make it a proper 6-wheel carriage chassis with a running board and running step (see the S&DJR Farish Carriage Conversion thread to see how I did this previously). 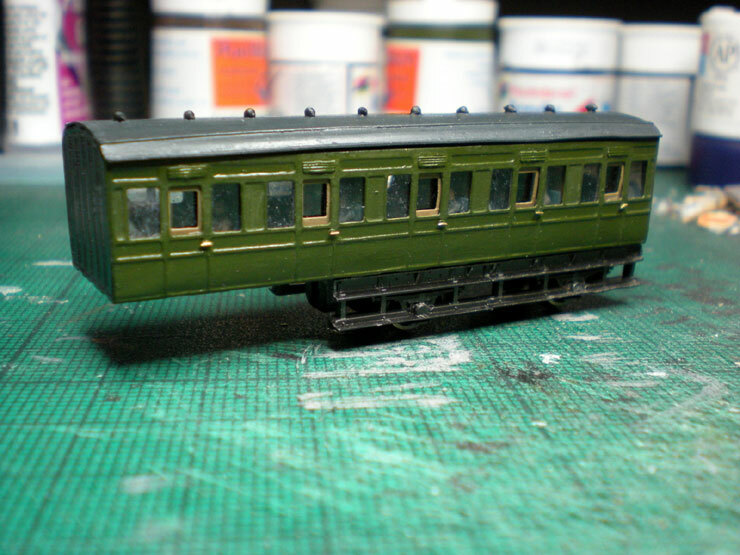 Someone came up with the idea of using the chassis from a Peco brake van, which already had the running boards in place, and this is what I went with. To get the correct wheel spacing that meant chopping two chassis into four pieces and using three of those pieces. It took a while to work out the proper lengths but the cutting part was easy enough. A little filing made sure that the fit was about as flush as could be hoped for. You can see the gaps between the three chassis pieces here, although it's the running boards that really have to be matched up as this is what will show when the carriage is on the tracks. The middle set of wheels couldn't be fitted in the normal way. 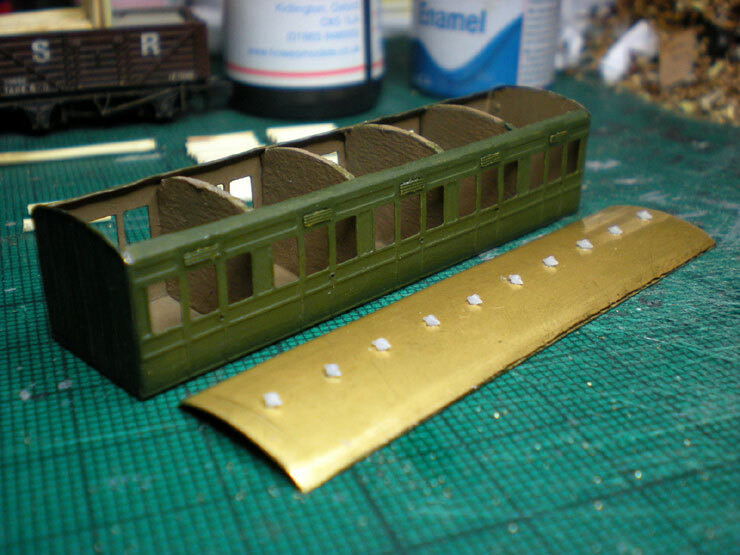 The length of the carriage meant that fixed wheels forced it to derail on some of the tighter curves on my layout. Instead I followed the principles set by the Stove R chassis and created a stand-alone, free-floating wheel holder - two staples bent to shape and glued into drilled holes in the chassis. That really does do the trick, although it's best to add a soft piece of foam underneath to help keep the wheels down, and also to file off the spiked wheel points that would normally hold the wheels in place in the axle box. This bit is important to get right or the filed wheel ends will catch on the chassis and cause all sorts of problems. File the wheel points flat and you'll have some wonderfully free running. 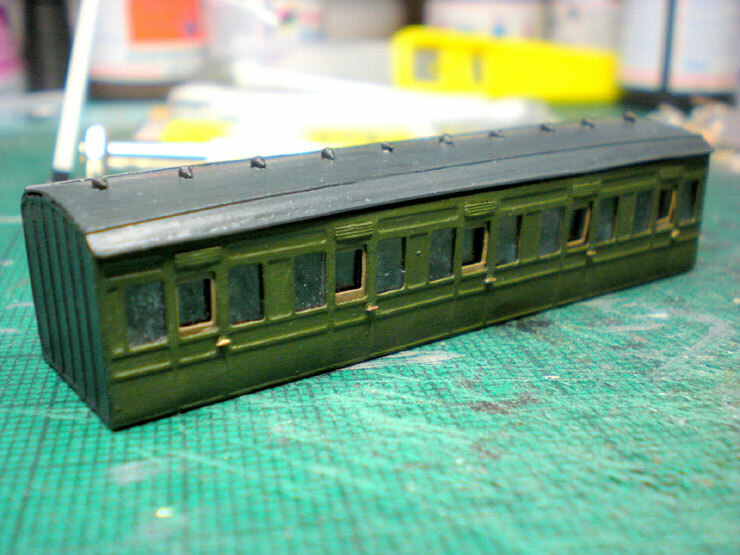 Also added here is the battery box so ensure electrical lighting to the carriages. 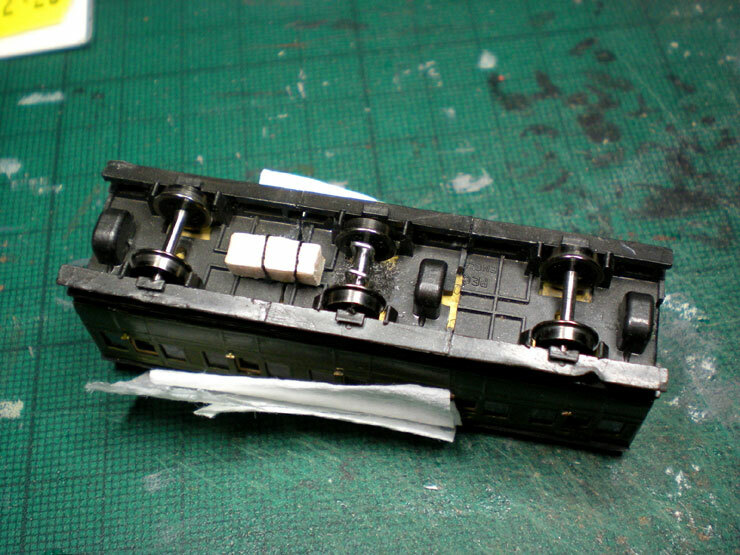 I'd do the dynamo too (which generates the electrical charge as the carriage wheels turn) but it's a flimsy piece of equipment in N Gauge terms and I haven't found a satisfactory way of representing it. 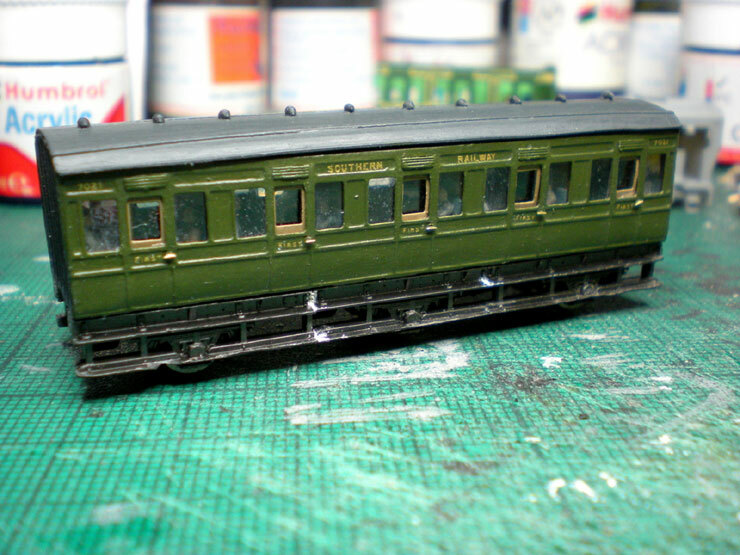 One of the last steps is to add Fox Transfers' 'Southern Railway' lettering above the window line, and the class lettering on each door, plus the carriage number - four times no less, twice per side! The brass door handles show up well here, and you can see the little bits of filler used to mask the gaps between the three chassis pieces. When filed and painted black you'll never even know those gaps were there in the first place. 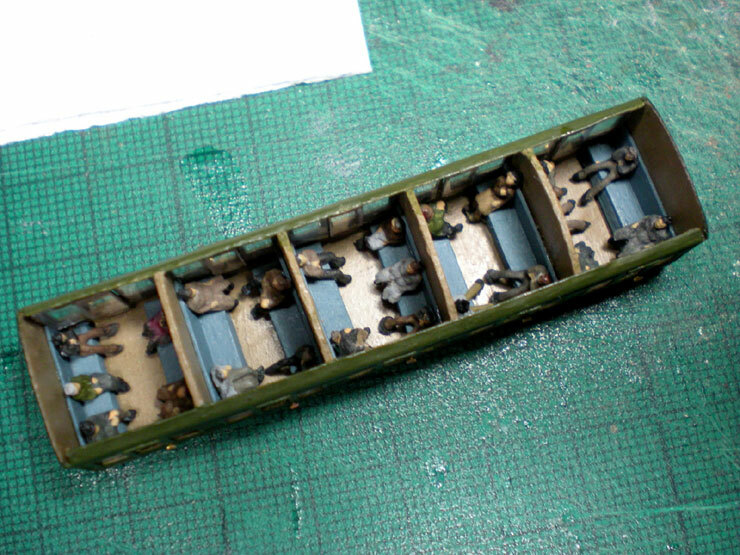 A slightly murky shot of the carriage on the layout, although it doesn't have any couplers as yet. A staple will serve as the connecting bar between carriages, with a spring on one end to force them to close couple, but still allowing them to open up on the tight curves. 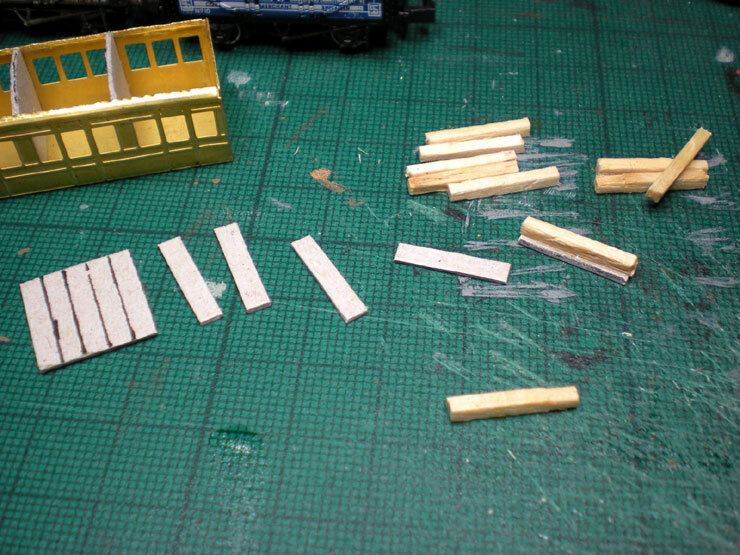 The next stage will be to built an end-first and a saloon so that I can get a normal Rapido coupling on the set and actually connect it up to a loco. At the moment it can only be used in push-push services... and not on any hills!